Anybody who writes about cycling outside of northern Europe could do a weekly column on the worst bike racks. They’re everywhere. Most of them look like this one, but even the newer designs regularly fail on enough clearance for fenders and lights. I always have to lock up at the end of a rack because of my light. So here it is, the ubiquitous US bike rack. Slats so short and narrow they only accommodate thin tires and even then not enough for the wheel to come far enough through to lock the frame to the rack. What makes this one the winner in worst rack is the stone wall. The rack is bolted into the asphalt a few inches back from the wall so that approximately zero people can lock their bikes to it. Bonus points for wedging it in a tiny triangle between the entrance—where people tear into the lot—and the first parking space, which starts on the other side of the line. You’re right ! 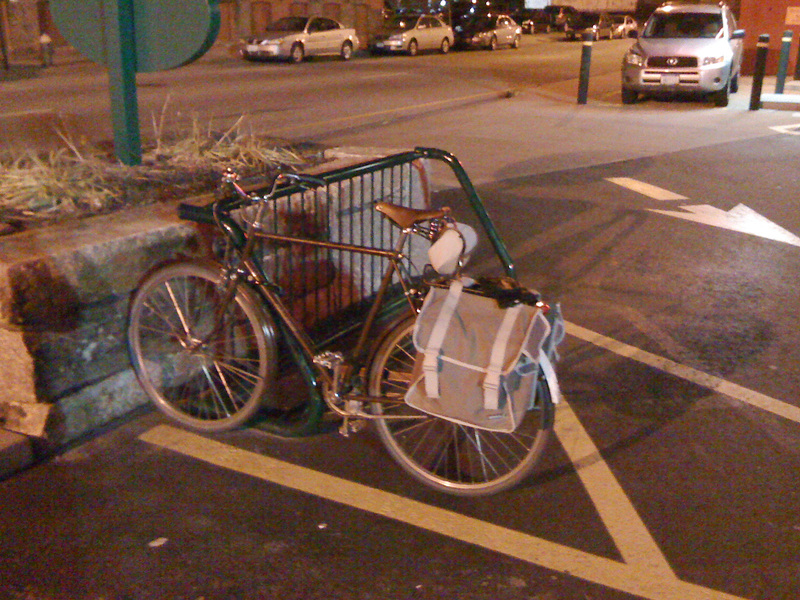 I’ve been doing a “bike parking hall of shame” off and on for the past year or so, on Friday’s on my blog. Lately I’ve been showcasing good parking for a change, and I’ve teamed up with Grid Chicago for a Bike Parking Award ( good and bad). There are plenty of examples of both. And oh do I hate those racks like the one you picture above! Excellent! I like that idea for a change. There are a handful of hitching posts around that would do well in the Good Hall. We don’t have bike racks at any of the nearby stores, and they don’t seem inclined to install them. I was threatened with a citation the other day for securing my bike to a Handicapped parking sign! When I asked for suggestions as to another place to secure the bike, they didn’t have any. Sad part is the letter of the law they were citing had to do with blocking/occupying a handicapped space, which I WAS not doing, I had the bike on the back side of the sign…need to consider moving, anywhere that has bike racks.